Please note, Fox is now closed. Time Out Editors, July 2018. Occupying a sizeable corner spot between Shoreditch and Dalston (you’ve no doubt whizzed by on the bus before), The Fox is a very worthy pub (or, as they’d prefer it, a ‘craft beer house’) that’s much-beloved locally. Ten draught pumps and eight hand pumps serve a rotating selection of fine ales – regularly featured brewers include Dark Star from Sussex, Harviestoun from Scotland and Thornbridge from Bakewell. There’s usually a couple of ciders on, and a proper connoisseur’s depth to the bottle menu: everything from Hawaii’s Maui Brewing Mana Wheat (with tangy overtones of pineapple) to the Aussie stalwart Little Creatures Pale Ale’ (refreshing and satisfyingly bitter). The Fox isn’t cheap for the area, but midweek it’s usually easy to get a table, or a bench on the neat little roof terrace. Great selection of craft beers in a really nice space in south Dalston. It was busy but we easily got a seat which is nice for a Saturday evening as the place is pretty big. Its a cosy place while still being large which suits chatting and drinking. This was a delightful little pub that I was very happy to be introduced to this last week. Like almost all my favourite pubs, cozy seating, large windows for light to stream through (should that be the case) and a heffe-weizen on tap for many a-pints! What made this pub even more delightful was that little puppers (dogs) were allowed in, and many of them friendly, will give you a sweet little nudge whilst ordering at the bar. I got to pet a boxer and a dashund! The only disappointment was not getting to see the beer-vending machine in action, as apparently it was out of order. Hopefully, next time! The fox has finally found it's calling, having changed management a fair few times over the past years, since deciding on becoming a speciality craft beer pub it has been holding it's own and enjoying a steady success and name in the neighbourhood. Its best kept secret is their roof terrace, roll on the summer months. Popular bar few minutes away form the heart of Dalston, thanks to which you can find a table on Saturday night even when it's busy. The selection of craft beers is excellent, but pricey. Any beer I went for was £6.5 which I felt was way beyond the average even for Dalston. I tried the Black IPA and it was supper aromatic, flowery and on a heavy side. The milk stout wasn't the best I tried and the grapefruit beer was totally not up to my taste. The bar staff was OK, but the problem I had was the clientele. I've experienced exceptional rudeness in the first 4 minutes upon arrival in the queue to the bar. People were pushing and punching without any 'excuse' offered. I don't know if it's maybe it's the booze price that makes people so rude there. Beers are ok. Staff are rude. Food quality has dropped a lot from what it used to be. East London is suddenly awash with stylish taprooms, trendy tank bars and microbreweries, all overshadowing the humble boozer. 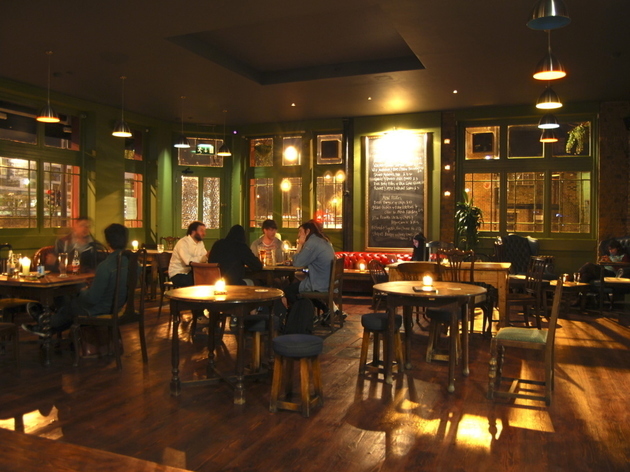 In contrast, The Fox is an honest pub in Haggerston that happens to proffer an exceptional range of craft beers from local and international breweries. Comparable with the Jackdaw and Star and The Adam and Eve in Homerton, The Fox boasts a vast range of alternating beer selections on draught and on cask. The ostensibly ‘conventional East London pub’ setting lends a more casual and charming atmosphere compared to the minimal industrialist décor now ubiquitous in polished taprooms, but prices are still in line with more trendier spots. Despite this, the relaxed environment, interesting beers and the laidback staff make The Fox a no brainer for a casual drink. The craft beer offerings are expansive and represent a range of styles- I popped in recently and enjoyed two sour beers: the Far Skyline from Buxton Brewery and the Saison 14 from Weird Beard. I also sampled Softly Softly, a collaboration between Lervig Aktiebryggeri and local brewery Redchurch, and advocated Smog Rocket- the seminal porter from Beavertown- on the less fanatical beer drinkers in the group. Perfectly signifying the quirkiness of the pub is a vending machine in the corner that dispenses a selection of bottles and cans from the likes of Brewdog, Beavertown, Weird Beard and Lervig; replacing the need for a bottle shop, your purchase can also be consumed in-house. Conspicuous cans of Beavertown’s Gamma Ray are prominent when this popular choice isn’t available on keg at the bar. The bar staff are obliging, but don’t have the training or extensive knowledge of servers at a more serious taproom. But this only further contributes to the relaxed atmosphere. Bartenders will let you sample something if you ask and will make a recommendation based on their own tastes, which is enough to start drinkers on the right path. The bar is always lively and the rows of tables fill up quickly on a busy night. There are some ledges for perching, but it can be difficult to get a seat in the main bar- however, when the roof terrace opens in the warmer months, there’s more space for all patrons to enjoy. The food at The Fox is also commendable and popular- the servers are kept busy, regularly bursting forth from the kitchen with armfuls of burgers, fish and chips and sharing plates. There’s an emphasis on unpretentious fare made with locally scoured ingredients that is indisputably crowd-pleasing. 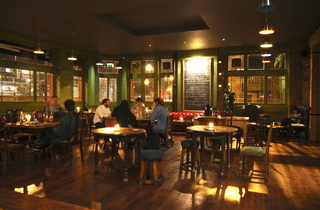 The Fox is an excellent spot to try something new and bring friends for a quick-but noteworthy- pint in East London. The Fox can be a little quiet sometimes, but it´s the perfect place for a date or a chilled drink with friends. Easy to chat and enjoy some great beers! Fantastic - this article helped me to discover a new pub in my neighbourhood with great draft beer. Fantastic food, great beers and super friendly people. It doesn't get much better. My new favorite pub to go after work. It's changed a lot.. very cosy, there's lots of space to get a sit even on a Friday night, all candlelit..and amazing beers! Great pub. Had a fantastic veggie Sunday roast here with a Yorkshire pudding as big as a saucer. The beer is a good selection, and the staff seemed friendly on all my visits there. Until the new owners took over this venue had long been a complete waste. Now they have excellent beers, good food, and great bar staff. A welcome addition and a much needed improvement. Great place. Amazing selection of beers, great food and a nice photobooth to remember the night! Probably the best burger i have ever had, along with an amazing selection beers! It's nice to go somewhere that isn't too cramped in this area and the smoking area/roof terrace is a dream. Would highly recommend this pub, really unpretentious, with really friendly staff. Good beer is not enough anymore, there are craft beer bars opening up every week in east London and all this has going for it is the beer. Was here recently and service was woeful, friends got cocktails which took a good 15/20 mins to arrive, food was fairly bland, atmosphere non-existant, tables dirty etc etc. No desire to go back. MAYBE gets three stars just for the sake of getting a decent US ale on Kingsland Road but it'd be generous. Perfect location on Kingland with the best selection of ales in the area. Not at all pretentious, just good quality food and drink accompanied by well chosen decor. Highly recommended.